→5 Best Wheatgrass Juicers for 2017- Enjoy the Best of the Best! ​Why Use A Wheatgrass Juicer? Why Not Some Other Device? ​How To You Differentiate Many Wheatgrass Juicers? How To Choose A Wheatgrass Juicer? Why wheatgrass?We are currently in the age of vitamin supplements and detox smoothies. In a bid to remain healthier many people have resulted in taking wheatgrass. Wheatgrass is known as a super food since it helps in reducing sugar levels, reducing blood pressure and increasing hemoglobin levels among other benefits. ​Since people like to take wheatgrass in juice form, many usually wonder which the best wheatgrass juicers are. ​So you want to juice some wheatgrass? What do you do? Do you need a juicer? Well, not necessarily. There are several ways to juice wheatgrass. You can decide to use a mortar and a pestle. People who have been juicing wheatgrass for long will probably tell you that utilizing a juicer is considered to produce superior quality of juice. Juicers can be quite pricey, but they are worth it. First of all, you need to know that there are two types of wheat grass juicers. These are manual wheatgrass juicers and electric wheat grass juicers. These juicers are operated manually using a crank. They are exclusively used for juicing wheatgrass and are specifically designed to break down wheat grass. Their main advantage is that they are not dependent on the presence of electricity. They also provide a high yield of juice and produce minimal heat. Other benefits include the fact they are easy to clean, and you can move with them to wherever you want. They are also cheaper than their electric counterparts. Their only disadvantages are that it may be tedious to use them and that you cannot use it for other vegetables. You can find a video here which shows how to use one of these to juice. These juicers use electricity and are much more expensive and harder to find than the manual ones. They also occupy more space than the manual ones. Their main advantage is that they allow you to juice not only wheatgrass but also other vegetables. There are two types of electric juicers. These are masticating and centrifugal juicers. These have blades that move at a very high speed, which cut the wheatgrass. Separation of the juice from the pulp takes place by the action of centrifugal forces created by the high speed of the juicer. Due to its high speed, it produces large quantities of juice. Anyone who has been juicing long enough knows that these aren’t the best for juicing wheatgrass. The use is avoidable because their high spinning speed leads to the production of heat, which causes oxidation of the juice reducing its nutritional value. You will notice juice has become oxidized by the change of its color. 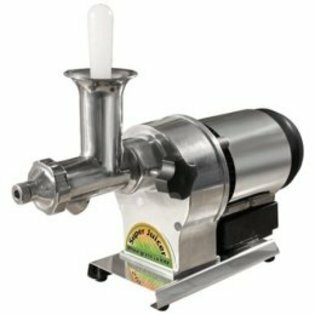 The masticating juicer grinds the vegetables and then extracts all the juice from the pulp after which you discard the pulp. This juicer operates at much slower speeds than the centrifugal one, resulting in little juice extract. Its main advantage is that it produces juice of superior quality. The juice does not lose any of its nutrients. Its low speed makes it able to extract trace minerals and vitamins without heating up too much. Heat is what destroys juice nutrients. Juice made this way will also last longer, so you have the option of storing some for later. This juicer is more expensive than the centrifugal one, but it is worth it. Another advantage of this juicer is that it can be used to juice any fruit, vegetable or grass. When choosing a wheatgrass juicer, you need to decide whether you prefer a manual or electric one. If you are looking to save on power and don't mind the cranking, then manual is the way to go. It makes no sense for you to buy a juicer that does not fit in your kitchen. You need to consider this when choosing a juicer, seriously. After all, juicers come in all sizes. I am sure that you will find one that is perfect for you. When juicing wheatgrass, the lower the rate, the better. You should put this into consideration. Whether you prefer a juicer that can only juice wheatgrass to one that can juice a variety of fruits and vegetables is a vital aspect of choosing a juicer. At the end of the day, you can only buy what you can afford so choose wisely. A good juicer should have this to control its pressure. You should always check for this. 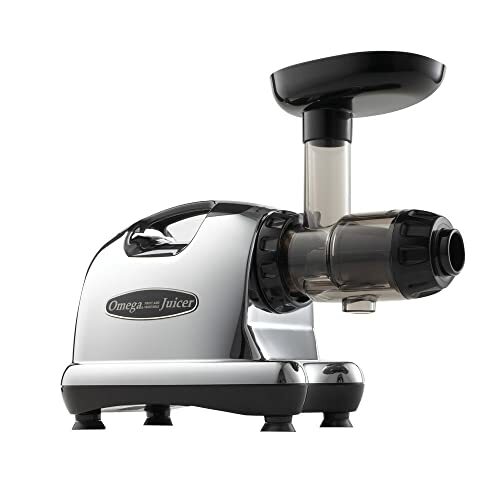 This Omega J8006 is a masticating juicer. It is my personal favorite and is one of the most reviewed juicers. Its pros and cons are as listed below. 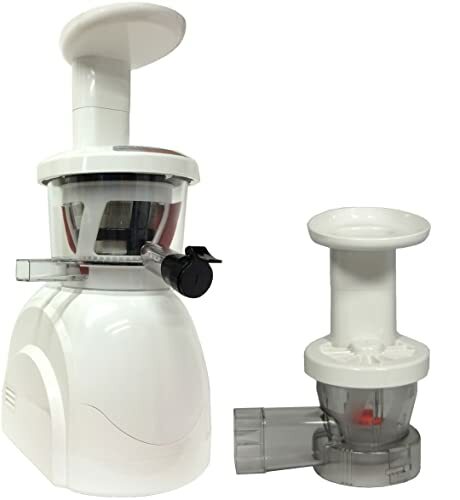 It has a speed of 80 RPM, which is significantly lower than most of the juicers on the market. This little speed ensures reduction of foaming and heat generation in the juice. It also ensures that the juice does not oxidize quickly. It has a dual processing system which makes sure you get the maximum amount of juice from the pulp. It is evident from the dry pulp produced. It has an inbuilt screen which allows for automatic removal of pulp during continuous juicing. It comes in black and chrome making it both modern and attractive. It is versatile. It not only juices but can also be used to make nut butter from nuts. It has a 15-year warranty so even if it gets damaged right after you buy it you don't have to worry. It is silent so you can even have a conversation while blending. It has only four parts which can be easily assembled and disassemble, making it easy to wash. The feed chute is small, so it cannot accept big pieces. You have to chop them into small pieces. The juice output is opaque, so it can be discolored by carrot and beet juices if not washed properly and you would not even notice. The auger and plastic parts are prone to damage, and this can be inconveniencing. The screen can clog, forcing you to unclog them physically. The HD-770 is also a masticating juicer. It is very comparable to the Omega J8006. 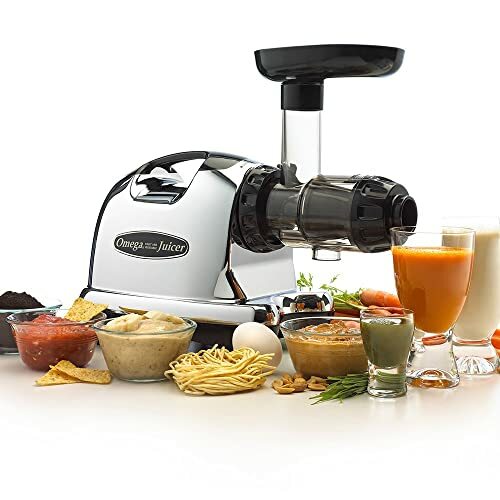 It has a 200-watt mortar which spins at 47 RPM, making it one of the slowest juicers in the market. It has a low speed of 47 RPM, making it able to produce high-quality juice with high nutritional value. It extracts the maximum amount of juice from pulp. 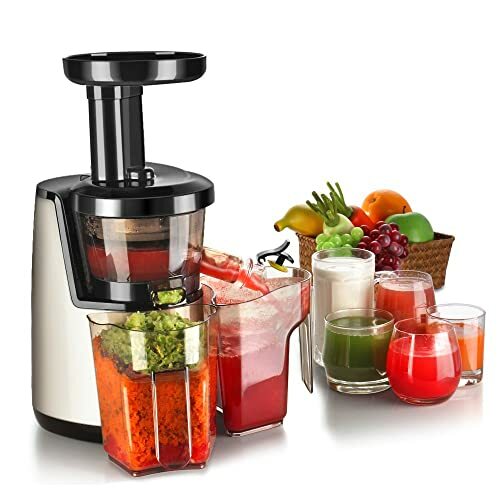 It has an automatic system for removing flesh from it during continuous juicing which makes it very convenient. It is not only used for juicing but also for making sauces and kinds of butter. It has a 10-year warranty on its motor and a 1-year warranty on its other parts. It is not suitable for juicing hard vegetables like carrots and beets. You will need to crush them first. SB0850 is a juicer made specifically for juicing grasses. The material is of surgical stainless steel which is a better material to use than plastic since it does not alter the taste of the juice. It also has easily accessible forward and reverse buttons which will come in handy when something gets stuck in the juicer. ​It has the following advantages and disadvantages. It produces juice at 5 ounces per minute, which is very fast. It has a self-feeding tamper which allows you to multitask. It can juice frozen grasses which can come in handy when you have a lot of wheatgrass but just want a little juice. You can freeze the remaining grass for later. Since its material is stainless steel, it is quite easy to clean by simply using hot water. It is quiet, so your neighbors won't be bothered by it. At 30 pounds, it will be hard to move around with it. 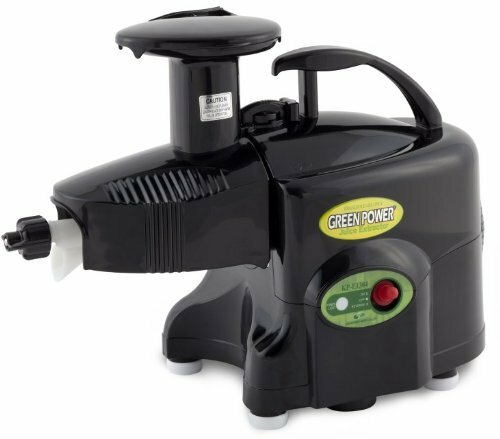 This KPE1304 is a juicer that can be used to juice wheatgrass, vegetables, and fruits. If you are looking for a slow juicer, this one may tickle your fancy. It has the following advantages and disadvantages. Its bioceramic and magnetic technology coupled with its low-speed lead to the production of high quality, long lasting juice. It has three strainers which ensure high-quality. It is versatile. You can use it to juice grasses, vegetables, and fruits. It is quiet, so you can use it without being afraid of driving your neighbors insane with the noise. It has two adjustable pulp outlet caps that let you get high levels of juice extraction. It comes with a large cup so you can make a lot of juice at a go. It can come in handy when you have guests. The strainers tend to get clogged when juicing fruits like apples causing inconvenience. The sieves are hard to clean. It is a masticating slow juicer. Since it is a cold press extractor, it uses a hydraulic press system to extract juice. It comes with a vertical stand for fruits, vegetables, greens, wheatgrass and more. It also comes with a big cup and juicing bowl. It weighs 17 pounds. It has a large feed tube to allow for large pieces of fruits or vegetables. It has a tap that can be connected to the juice output to control the flow. Its low speeds of 67 RPM enables it to produce high-quality, and that which does not oxidize quickly. The feed chute is long, making it easier to feed on grasses without having to chop them. It is quiet, so you can use it without causing a disturbance to others. The cup size allows you to make large quantities of juice at once. It produces wet pulp, meaning it does not extract the maximum amount of juice. The juice it makes has some pulp remaining in it. It is quite obvious that the best wheatgrass juicer among the ones mentioned above is the Omega J8006 Nutrition Center model. Its pros greatly outweigh its cons. Even though it is not the slowest, it extracts the maximum amount of juice from the pulp, and it produces superior quality. ​The high quality is because it is the only juicer mentioned above that has a dual extracting system. It is usually considered an elite juicer. It is also the only juicer with a warranty of 15 years. In general, it has the most number of advantages when compared to the other mentioned juicers. ​This juicer fulfills all the qualities you would search for in a juicer. It is an electric juicer making it less tedious and faster to use. Another plus is that it requires little storage space in your kitchen.